The harbor of Joppa is adjacent to the oldest part of the city—where Simon the tanner had a house by the sea. If we think boundaries of our faith communities shift rapidly today, consider the speed and scope of change in the book of Acts. When persecution made most followers of Jesus flee Jerusalem, Peter ended up ministering in Samaria, of all places! Astonishingly, Samaritans—a heretical sect in the eyes of most Jews—received the Holy Spirit (Acts 8:14-17). More surprises followed. Peter went toward the Mediterranean coast to Lydda, where God used him to heal a bedridden man named Aeneas. Word of that miracle reached nearby Joppa—home of Dorcas, a woman “devoted to good works and acts of charity” (9:26). When Dorcas took ill and died, friends summoned Peter from Lydda. He prayed alone over the body of Dorcas, and God restored life to this generous woman. Bending rules for a devout Jew, Peter lodged with a tanner named Simon who lived by the sea at Joppa. Touching animal carcasses made Simon ritually unclean. Tanners used feces and urine in the leather curing process, making theirs a wretched-smelling business for low-class persons. In that unlikely setting, God prepared Peter for the biggest leap of all. While in a trance, and perhaps hypoglycemic from hunger, Peter saw a great sailcloth being lowered from heaven. It was bursting with critters—apparently a mixture of ritually clean and unclean animals (Leviticus 11). A voice said, “butcher these, and eat!” Peter had plenty of biblical reasons not to do so, but the voice said, “What God has made clean, you must not call profane” (Acts 10:15). 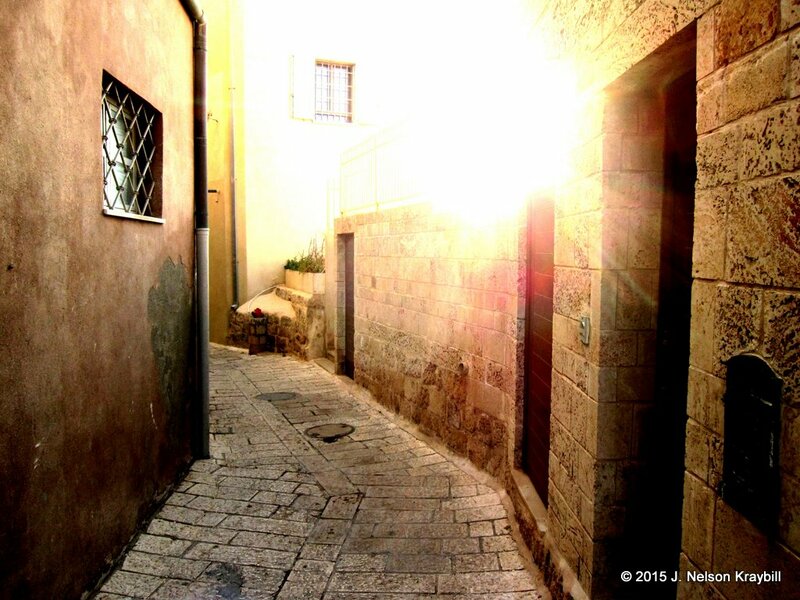 With brilliance evoking the vision of Peter in this neighborhood two thousand years ago, sunlight bursts into a dark street of modern Joppa . No sooner had the vision ended, than three men from Caesarea appeared at the tanner’s house. Their master Cornelius, a Gentile centurion of the most powerful army on earth, had sent them on the forty-mile journey to Joppa. Cornelius also had seen a vision, in which an angel of God had directed him to summon Peter to his house. Would the devout fisherman, already stretched to the limit by association with Samaritans and tanners, minister to a military guy in a foreign army? Peter’s courage in going to Caesarea brought salvation—and the Holy Spirit—to Cornelius and many of his relatives and friends. Peter reminded them that it was “unlawful for a Jew to associate with or to visit a Gentile.” But since God came “preaching peace by Jesus Christ,” everyone who believes in him receives forgiveness of sins (Acts 10:28, 36, 43). Debate about Jews relating to Gentiles smoldered for decades, much like discussion of church boundaries is on a long burn today. There was a heated conference about boundaries at Jerusalem (Acts 15), a flaring of tempers between Peter and Paul at Antioch (Galatians 2:11-14), and the boundary-related arrest of Paul at Jerusalem (Acts 21). Amidst this turmoil, the Spirit was at work. Take heart, fellow Christians embroiled in conflict: the church belongs to Jesus, not to us. If Peter and Paul could disagree and still be brothers, the God who preached peace by Jesus Christ will stabilize and build the church in spite of our struggles. Want to see Jordan, Israel, and Palestine? Join a Peace-Pilgrim bible study tour this fall. See Holy Land (Jordan, Israel & Palestine) with Pastor Nelson Kraybill – November 5-16, 2015. Please enter your email address in the designated box at the edge of this webpage if you have not already subscribed, and click Follow. You’ll get a notice every three or four weeks when I put up a new blog post. Ponte Fabricio (“Bridge of Fabricius”) dates from 62 BC and conveyed traffic to the Jewish neighborhood of ancient Rome where most of the earliest Christians probably lived. Paul, ambassador of the early Christian movement, was passionate about taking good news of reconciliation in Jesus Christ to Rome, capital of the empire that crucified his Lord. The apostle yearned to show God’s love to everyone from slave to emperor. Along with Peter and many others, Paul apparently died a martyr at Rome. Ponte Fabricio (“Bridge of Fabricius”) across the River Tiber is a place to ponder how and where Paul might have spent his last years. The book of Acts states that Paul, after arriving at Rome as a prisoner awaiting trial, continued his ministry under house arrest. Only one soldier guarded him, suggesting the imperial government did not consider him a danger. Paul arrived in Rome about AD 60, and may have lived among Jews in Trastevere (Tras-TAY-very, “across the Tiber”). 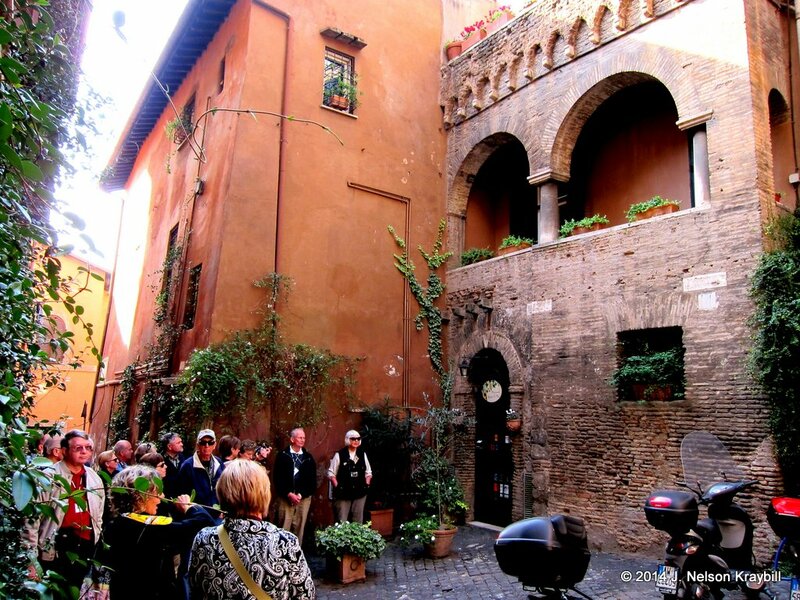 This was the primary Jewish quarter of first-century Rome, a working class neighborhood directly across the river from the heart of the city. 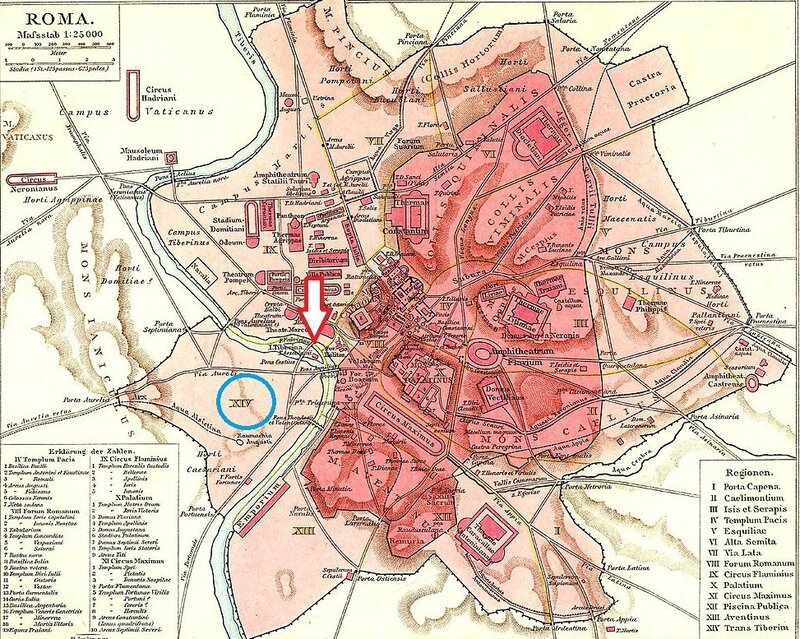 The white arrow shows where Ponte Fabricio crosses the Tiber to an island in the middle of the river. A modern bridge then extends from the island to Trastevere–the Jewish neighborhood marked here with a blue circle. Trastevere was a harbor and warehouse area for boats coming up the Tiber from the seaport at Ostia. The district teemed with sailors, porters, shopkeepers, and craftsmen. Millers ground wheat arriving from Egypt, and the stench of leather tanning filled the air. Years earlier, still thinking that he first would visit Rome as a free man, Paul wrote that faith of the church there was “proclaimed throughout the world” (Rom. 1:8). Paul hoped to visit the imperial capital and let that church send him on for witness in Spain (Rom. 15:28–29). Instead, he got charged with disturbing the peace when he visited Jerusalem, and came to Rome a prisoner. Regardless of exactly where Paul resided under house arrest in Rome, Ponte Fabricio would have been a pedestrian and vehicle artery connecting him with fellow Jews. The name Lucius Fabricius, Roman commissioner who built the bridge in 62 BC, still is legible on the side of the structure. 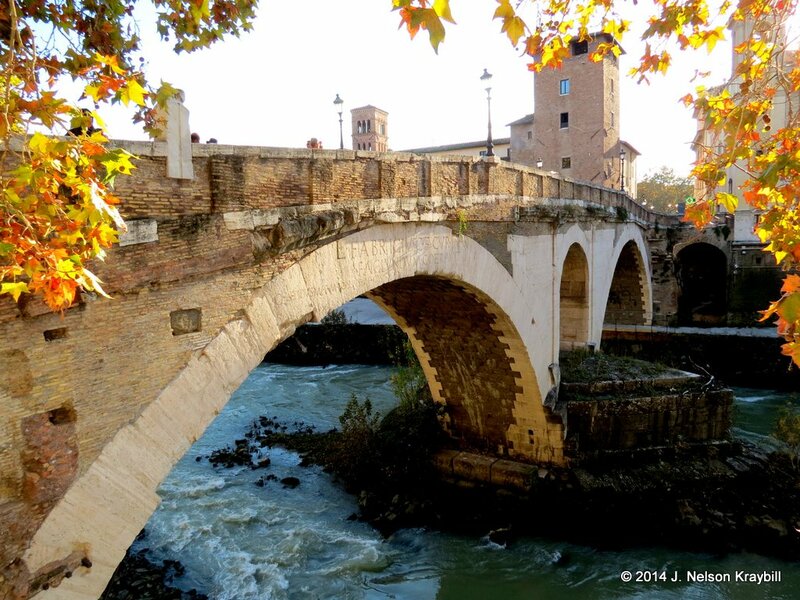 Made of stone, Ponte Fabricio survived the great fire of AD 64, when much of the city fell to flames. Suspected of having torched the city himself, Emperor Nero accused Christians of arson. Tacitus (AD 117), says an “immense multitude was convicted,” and many suffered cruel death at orders of the emperor. It is likely that both Peter and Paul died in this short spate of severe local persecution. This tenth-century facade is all that remains of the oldest synagogue building in Trastevere–remnant of an ancient Jewish community where the gospel took root in the first century. Several of the oldest (fourth-century) archeological sites of early churches in Rome are in Trastevere, and the façade of a tenth-century synagogue survives. These show that despite occasional harassment or persecution, Jews and Christians remained a significant presence in that part of the ancient capital. To them and to all who would listen, Paul wrote, “I am not ashamed of the gospel; it is the power of God for salvation . . . to the Jew first, and also to the Greek” (Rom. 1:16). Confident that God would unite and restore all things in Christ, Paul ministered in urban hubs where the gospel could have maximum impact. If you want to see Jordan, Israel, and Palestine, join a Peace-Pilgrim bible study tour this fall, see Holy Land (Jordan, Israel & Palestine) with Pastor Nelson Kraybill – November 5-16, 2015.